As of January 2019, there were more than 1 billion monthly active Instagram users, up from 800 million in September 2017. One of the most popular features among users is Instagram Stories, with over 500 million daily active users worldwide. 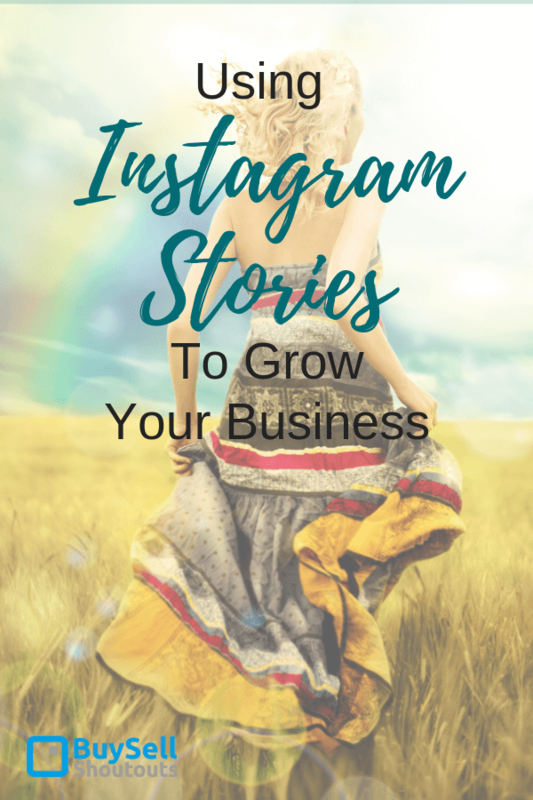 Using Instagram stories to grow your business? Instagram stories allow users to post videos or images that disappear after 24 hours. They offer business owners a great way to build an audience, promote brand awareness, and engage with users. Instagram stories can also help you drive traffic and sales to your website. Photos or videos posted to your story will appear on your profile – users can view it by tapping on your profile picture, but the images or videos won’t appear on your profile grid. Stories also appear at the top of your followers’ feeds, beside posts you share, and in your direct inbox. 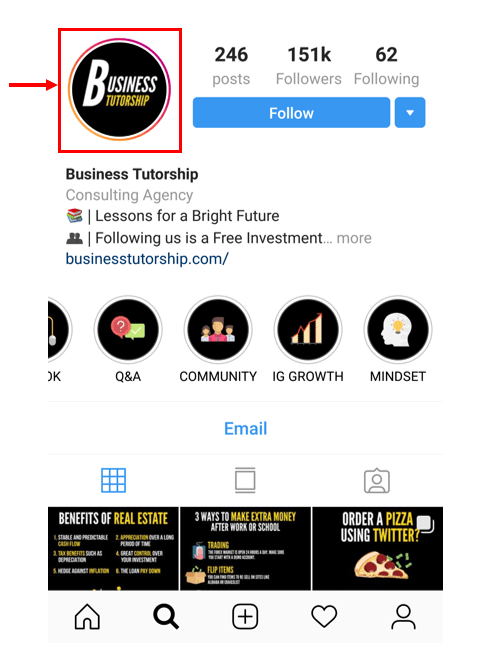 The following image shows the Instagram page of a company promoting a book aimed at helping businesses with their Instagram marketing. This company has an active Story which is indicated by the colorful circle surrounding the profile image. If you click on the image, you’ll see the Story. Stories shared by public accounts can also appear in Search & Explorer (Instagram’s search feature). If you add a hashtag, location or location-based sticker to your story, it may appear on the hashtag or location pages in Instagram. Before you get started with Stories on Instagram, you should create a Facebook page for your business (if you don’t already have one). This step isn’t required, but it is helpful because it allows you to advertise on Instagram, set up Shopping on Instagram (if you’re a retail store), and run Instagram and Facebook ads from your page. Anyone can convert their Instagram profile to a business profile and all businesses should. Here are the steps to do that. Important note: make sure your Instagram profile is public or you won’t be able to switch it to a business profile. Once set up, your Instagram Business Profile gives you access to additional features such as being able to promote your posts and including contact information about your business (phone number, email address, and physical address). When you add your contact information, a “Contact” button appears near the top of your profile that gives people options to contact you if they click on the button. Options include: Get Directions, Call, and Email. Business profiles also get access to Instagram Insights which gives you data about your followers and how they engage with your posts. 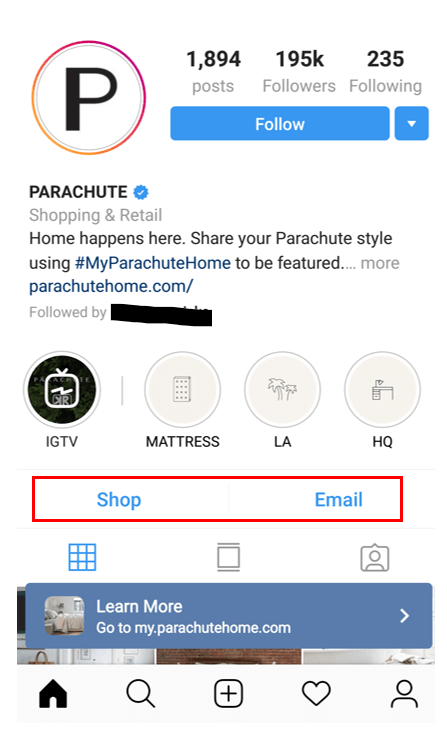 This Instagram profile for home goods retailer, Parachute, contains “Shop” and “Email” buttons (in the red rectangle) as part of the business profile information located above the profile grid. There’s also an overlay at the bottom of the profile which links to the vendor’s website. Instagram Stories are used in a variety of different ways by businesses. The sky’s the limit when it comes to leveraging them. Here are some of the different ways that businesses use Stories to promote their products and their brand. This is using Instagram stories to grow your business. 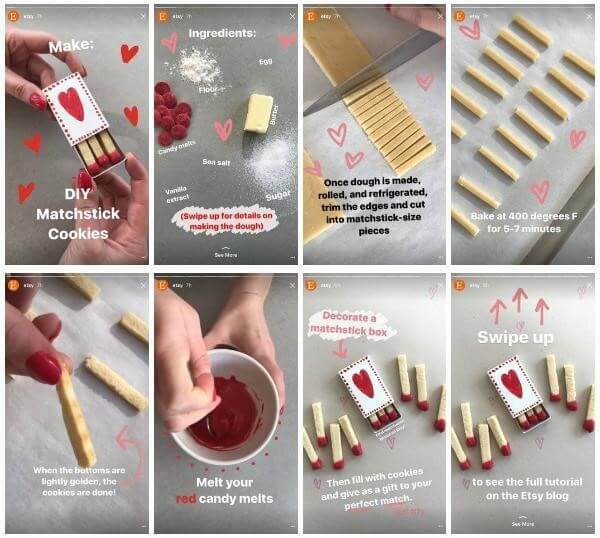 Retail brands like Etsy and Home Depot have used Instagram Stories to promote DIY projects in several steps. Stories are perfect for this type of promotion because they enable businesses to create multiple cards or videos to illustrate each step of the project. 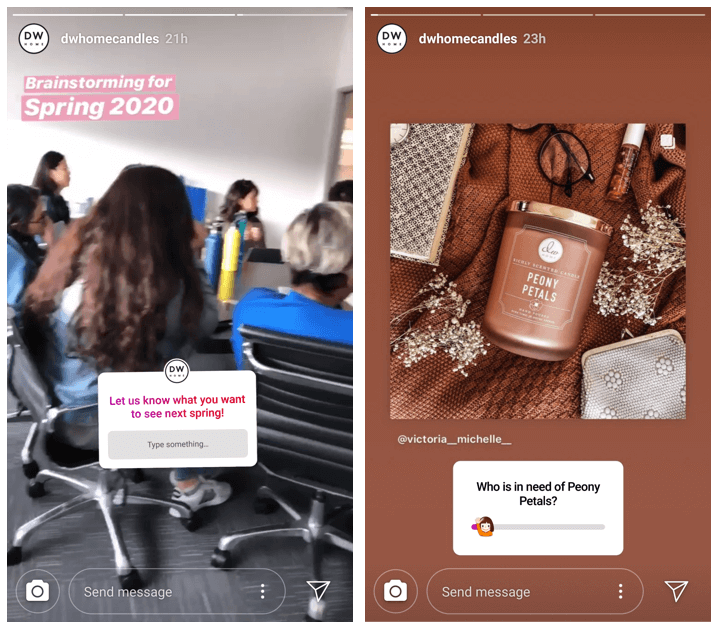 Instagram Stories provide an ideal way to frame your company’s brand, particularly if you have a certain aesthetic you want to communicate (and don’t we all?) This makes it a great fit for a whole host of different business types—from selfcare brands to home goods to fashion. B2B businesses can also benefit from using Instagram Stories to brand their company or services. Stories can be integrated with a business’s overall social media marketing strategy to promote company culture, offer incentives as lead magnets (e.g., Download our free Infographic on time management!) and generate brand awareness. Parachute used Instagram Stories to promote their new L.A. office location. This Instagram Story is particularly effective because it communicates a tranquil and modern work environment while also showing off Parachute’s products. You can embed surveys, tag other accounts, share polls, ask questions, use interactive “stickers”, and include videos as well as photos in your Stories. All of these features foster engagement (even if that engagement is a click through to your website). Businesses with over 10,000 followers and a business account can include a link in their Story. Viewers simply swipe up on the Story and they are taken to the business’s website (or whatever URL they want to promote). 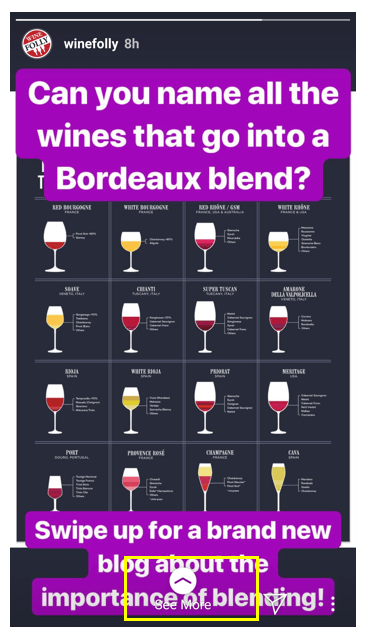 This above image from Wine Folly (a publication dedicated to teaching people about wine), uses an infographic to illustrate their point. The link to their blog is highlighted in yellow and the call-to-action text provides some context to the image (e.g., a new blog dedicated to the importance of blending wine). These above images from candle manufacturer, DW Home, show another interactive feature—surveys. The first tile prompts users to provide feedback on what kind of products they’d like to see for spring while the second asks users to express their level of interest in one of DW Home’s products (the slider at the bottom of the tile can be moved left or right depending on the user’s level of interest in the product). Both Stories encourage user engagement and interaction. Instagram launched their Stories feature in August 2016 and it’s become wildly popular since then, but it’s still relatively new as a tool for business promotion. 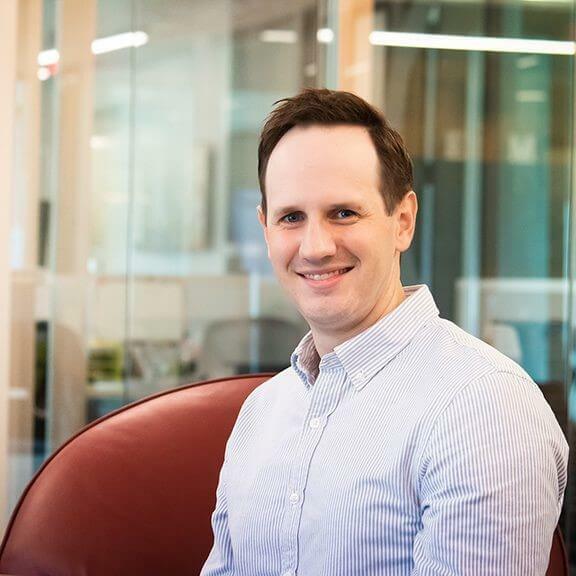 In fact, except in the consumer retail space, it wasn’t easy to find examples of businesses that use Stories well (or at all), which means there’s plenty of opportunity for businesses of all shapes and sizes to leverage this new medium. Stories are a great way to introduce your company to an engaged audience (particularly Millennials and Generation Z’ers). They’re are mobile friendly and easy to create. Keep them in mind as another great digital tactic to add to your company’s digital marketing strategy in 2019 and beyond.